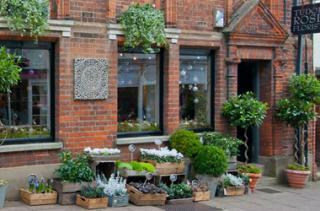 Inspiring florist and wedding specialist Danny Preston has earned a reputation as one of the best in the business. Danny is now sharing his extensive floral knowledge at the new Tudor Rose Flower School – passing on the skills which have given him so much job satisfaction as well as considerable personal pleasure. The warm and informal coaching sessions – held in the brand new design space created at our beautifully refurbished shop in Hatter Street, Bury St Edmunds – will be fun and informative with a magical sprinkling of Danny’s unique brand of inspiration. Morning, afternoon and evening workshops, of between six and eight people, are perfect for groups of friends and family looking for that special “experience” outing. Learn to make the lush Christmas door wreath you’ve dreamed of creating or how to transform a bucket of stems into a beautiful, bespoke bouquet. Whatever the results, cake and fizz will celebrate your achievements! Danny and his talented team also offer in-depth tuition for people looking to gain more formal floristry experience – possibly as the foundation for a new career. Day sessions and more extended teaching courses over several weeks – timed to coincide with large-scale wedding and event work – are available. One-on-one sessions on request.